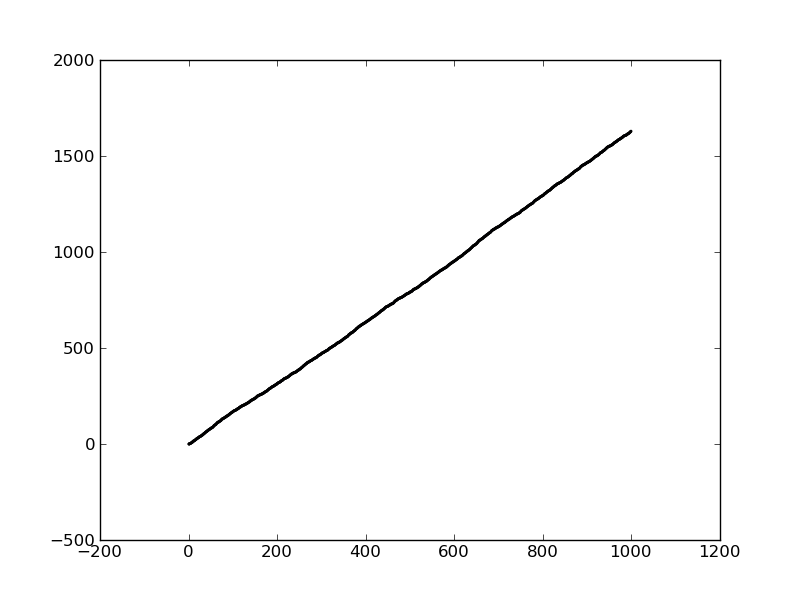 Home > guest post, math, statistics	> How much is the Stacks Project graph like a random graph? How much is the Stacks Project graph like a random graph? This is a guest post from Jordan Ellenberg, a professor of mathematics at the University of Wisconsin. Jordan’s book, How Not To Be Wrong, comes out in May 2014. It is crossposted from his blog, Quomodocumque, and tweeted about at @JSEllenberg. Given any assertion v, you can construct the subgraph G_v of vertices which are the terminus of a directed path starting at v. And Cathy finds that if you plot the number of vertices and number of edges of each of these graphs, you get something that looks really, really close to a line. Why is this so? Does it suggest some underlying structure? I tend to say no, or at least not much — my guess is that in some sense it is “expected” for graphs like this to have this sort of property. 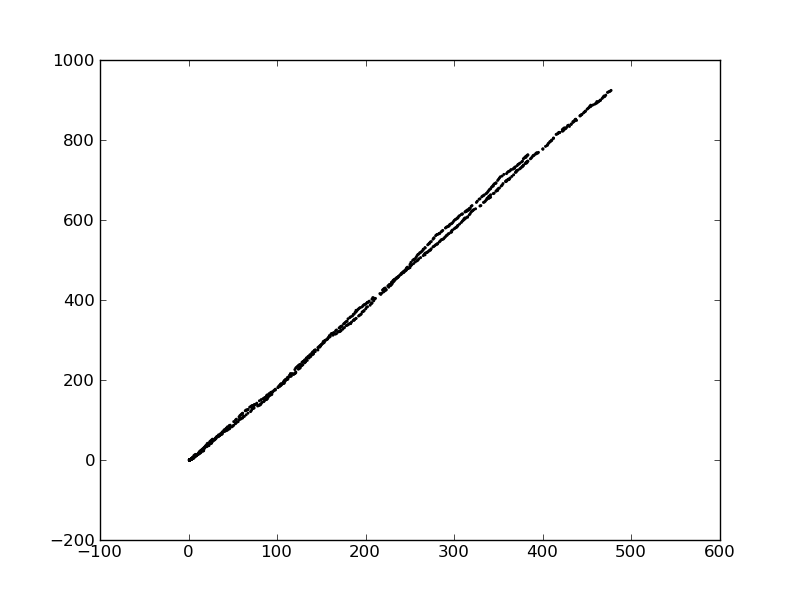 Here’s how Cathy’s plot looks for a graph generated by N= 1000 and f(k) = (2/3)^k, which makes the mean out-degree 2 as suggested in Cathy’s post. Pretty linear — though if you look closely you can see that there are really (at least) a couple of close-to-linear “strands” superimposed! At first I thought this was because I forgot to clear the plot before running the program, but no, this is the kind of thing that happens. My guess: a random graph aficionado could prove that the plot stays very close to a line with high probability under a broad range of random graph models. But I don’t really know! Update: Although you know what must be happening here? It’s not hard to check that in the models I’ve presented here, there’s a huge amount of overlap between the descendant graphs; in fact, a vertex is very likely to be connected all but c of the vertices below it for a suitable constant c.
I would guess the Stacks Project graph doesn’t have this property (though it would be interesting to hear from Cathy to what extent this is the case) and that in her scatterplot we are not measuring the same graph again and again. It might be fun to consider a model where vertices are pairs of natural numbers and (m,n) is connected to (m-k,n-l) with probability f(k,l) for some suitable decay. Under those circumstances, you’d have substantially less overlap between the descendant trees; do you still get the approximately linear relationship between edges and nodes?